Product Description Key Features Easy-to-complete final assembly Quique Somenzini design and attention to details Exceptionally strong, easy to repair, Carbon-Z® construction 5-channel control including functional flaps E-flite® 60-Amp Pro Switch-Mode BEC Brushless ESC included Digital servo control including operational flaps installed Pre-hinged control surfaces with control links installed Plug-in wings and stabilizers High-grade socket-head hardware use throughout Hatch covers provide easy access and a wide range of battery options Included 3 meter sailplane aerotow mechanism requires just a single servo—sold separately The optional camera mount (EFL1045023) is ideal for aerial photographers—sold separately Floatplane ready when used with the Carbon-Z Cub Float Set (EFL1045016)—sold separately Needed To Complete - 6+ channel DSM2/DSMX programmable transmitter - 22.V 6S 3200mAh LiPo flight battery - Charger for flight battery Optional Accessories: - Float set (EFL1045016) - Camera mount (1045023) - Tow release sevo (EFLR7155) Overview The E-flite® Carbon-Z® Cub aircraft is the first to offer patented Carbon-Z strength and rigidity in a giant scale package. Like the full-scale Cub Crafters Carbon Cub SS airplane, this ultra-lightweight model by World Aerobatic Champion Quique Somenzini is astonishingly versatile whether your intention is to cruise gracefully or surprise scale admirers with envelope busting aerobatics. Helping you at the sticks is the extraordinary AS3X® system built into the included Spektrum™ AR635 receiver, which makes it possible for you to experience agility far beyond the classic Cub form, while at the same time providing stability better than the original with control that’s always natural feeling no matter how you like to fly. Based on a platform known for its legendary versatility, the Carbon-Z Cub makes giant scale so simple—now even more RC pilots can go big. Its enormous Tundra wheels tackle just about any terrain you choose to romp from, or you can easily mount the optional Carbon-Z Cub Float Set so no RC adventure boundaries stand in your way. A mechanism is included for towing sailplanes with wingspans as large as 3-meters and there’s even an optional camera mount so you can take one-of-a-kind images from a bird’s eye view. Even if you get carried away, the Carbon-Z structure is easy to repair. A major part of what makes this giant scale icon so versatile is the control innovation package included as standard equipment such as the digital, metal-gear servos, and slop-free ball-link hardware. Because the included flaps are functional, greater control at low airspeeds is possible in addition to the ability to significantly shorten takeoff and landing distances. 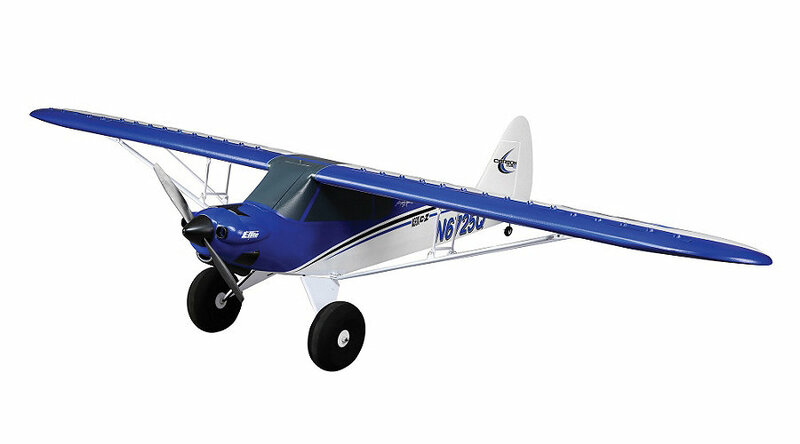 Although this aircraft may look tame, its brushless power system has been specially developed to offer incredible muscle for unbelievable STOL performance as well as the versatility to excel as a multi-purpose aircraft. Practically all that’s left to do is to bind to your favorite DSM2®/DSMX® compatible 6-channel computer transmitter for airplanes, a 3200mAh 22.2V 30C Li-Po flight battery and balance Li-Po charger.